“Speed: The Art of Performance Automobile” that inspired Salt Lake Community College’s Raw Couture fashion show is now on display until Sep. 16, 2012 at the Utah Museum of Fine Arts [UMFA]. The UMFA’s Speed exhibit offers the opportunity to see 19 classic automobiles that showcase history, design and engineering. Attendees have the chance to see everything from a 1904 race car to the 1975 Speed-o-Motive Special Streamliner which had raced up until the early 2000s. Speed has not only inspired car enthusiasts but artists, designers and fashion students as well. Seven of the vehicles have a direct Utah connection to the Bonneville Salt Flats. 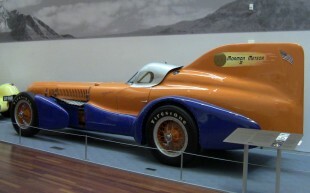 One of the vehicles is the 1938-built “Mormon Meteor III” that set more long-distance land speed records than any other car in history. Twelve of those records are still standing today. O’Hara likes to take people behind the “Mormon Meteor III” and show them that it was built 4 inches to the left because the car made left-hand turns. Looking at the car from the Fred Durst side you would never notice this little fact. O’Hara takes people to the back and lets them look at the aprons where the apron on the left is 4 inches wider than the apron on the right. 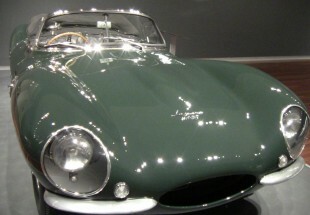 Other vehicles on display include in 1957 Jaguar XK–SS roadster once owned by the actor Steve McQueen from the movie “The Great Escape”. McQueen had this vehicle painted British racing green and customized the interior so he would have a place to put his sunglasses. When O’Hara was younger he saw this Jaguar on the streets. McQueen used to drive around Mulholland Drive looking for people to race. UMFA enjoys tying special exhibits in with their permanent collections. The museum has 19,000 objects with only a few hundred on view at a time. 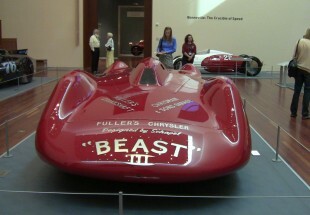 At the end of Speed, the museum will house a gallery full of permanent collection photographs related to automobiles. Tickets to the exhibit of Speed: The Art of the Performance Automobile are $18. SLCC students can enjoy the permanent collection at no charge. 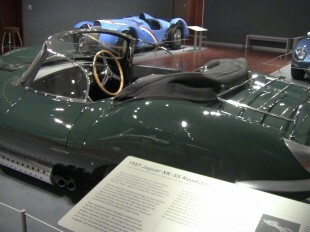 Steve McQueen’s 1957 Jaguar XK-SS Roadster on display at the UMFA’s Speed exhibit. 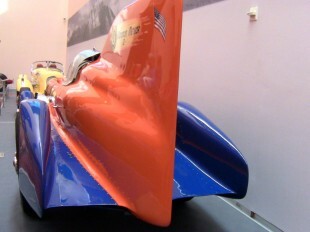 Moving art called the “Beast III” on display at the UMFA “Speed” exhibit. 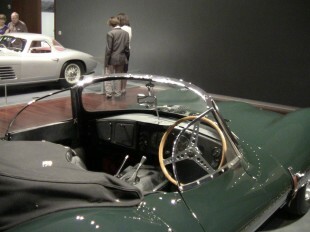 Steve McQueen’s Jaguar and Ingrid Bergman’s Ferrari on display at the UMFA’s Speed exhibit.